많은 분들이 요청하셔서 패스워드 복원 기능을 만들었습니다. 서버를 유지를 위해 소정의 금액을 청구하게 되었습니다. 암호 입력 창에 찾기 버튼을 누르시면 기능을 이용하실 수 있습니다. So many people have been requesting recovery of their lost passwords. I made this as a feature after all. 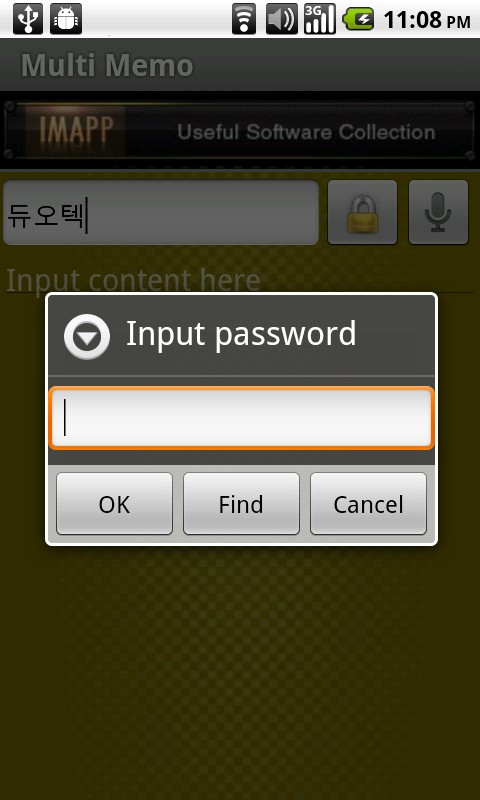 A new button is inserted between ok and cancel button in password asking dialog. Small amount of charge required as the maintenance fee of the server. 다음 창에서 구매를 진행하신 후 패스워드 보기 버튼으로 웹페이지로 이동해서 패스워드를 보실 수 있습니다. 보시기 위해선 고객님의 주 구글 계정 로그인이 필요합니다. 패스워드는 서버에서 지우시기 전까지는 서버에 저장되어 있습니다. * 주의사항 : 서버에 패스워드가 전송될때 인터넷연결이 활성화 되어 있어야합니다. 전송시 오류가 난 경우 패스워드 구매 창에서 패스워드를 다시 재 전송하실 수 있습니다. This button will lead you to purchasing screen, after successful purchasing, come back to the screen, passwords can be seen with the button "Show passwords". Passwords will be sent to server associated with your primary google account. Because this requires login in your google account, passwords can be safe even when you lost your phone. Recovered passwords are stored in the server until you explicitly erase them from the webpage. * Caution : The internet connection is supposed to be stable when sending passwords to the server. If fails, you can resend the password at the purchasing screen without repay.